The Aztec Empire was one of the most magnificent empires of the pre-Columbian Americas which ruled the region of Central Mexico during the 14th, 15th, and 16th centuries. It was established by the Mexica people in 1428 and continued to command the allegiance of the neighbouring city-states until it was conquered by the Spanish conquistador Hernan Cortes. Aztec society had a rich culture and art was influenced by various Mesoamerican civilisations of the past and enriched by them through original contributions over the course of centuries. There was a clear stamp of classical Mesoamerica civilisations on Aztec culture. In particular, this included the Olmec, Maya, Toltec, and Zapotec civilisations. The establishment of the Aztec Empire in 1428 had its own influence on the development of Aztec culture since it gave rise to a class society and increased importance of military virtues. The artistic and literary traditions of Aztec culture were also influenced by the previous civilisations, in particular the Toltec to whom the Aztecs traced their lineage. Art was an important cornerstone of Aztec culture and considered very important among the nobility as well as the commoners. Interestingly, there was not a specific word for “art” in Aztec language and instead things considered to be art were called “toltecat” which reflected the influence of the Toltec civilisation. Aztec art was rich in symbolism and reflected religious influence. Aztec music included a variety of sacred hymns, ghost songs, and songs of everyday life. Important instruments included drums of various types, rattles, flutes, and horns etc. For entertainment, Aztec culture also had various games such as the Aztec ball game called Ullamaliztli, patolli, and others. 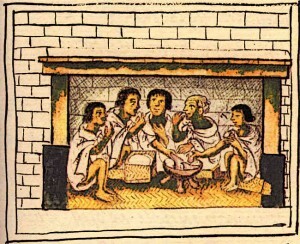 Aztec Culture Aztec Men Share a Meal – Aztec society had a rich culture that was influenced by various Mesoamerican civilisations of the past and enriched by them through original contributions over the course of centuries. Education was considered very important by the Aztecs and was necessary for all the Aztec children. In Aztec culture, education also included basic military training which was necessary for the male students. Military education was given by seasoned warriors in various military tactics and strategies. The knowledge imparted through education in Aztec culture included religions knowledge, history, literature, astrology, medicine, engineering, and medicine etc. There were separate schools for the children of the nobility and those of the commoners. Aztec culture had rich mythology and a polytheistic religion with many gods having specific functions. Aztecs believed that the world was created by the major Aztec gods Tezcatlipoca, Nanauatl, Ehecatl, and Quetzalcoatl. The Aztec belief system was rich in rituals and religious ceremonies were held at the end of each 20-day Aztec month. One of the most important aspects of Aztec belief system was human sacrifice which was performed during each religious ceremony. Prisoners of war, and sometimes even children, were used in these sacrifices. 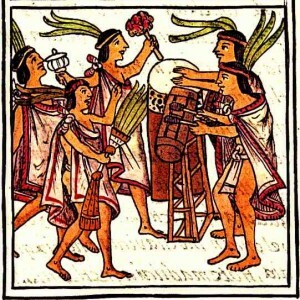 Aztec Culture Aztec Drums Florentine Codex – Aztec music included a variety of sacred hymns, ghost songs, and songs of everyday life. The ethics and morality in Aztec culture reflected a deep reverence for nature and stressed upon a life of balance and purity. This basic principle of balance and purity governed Aztec attitudes, conducts, and management of the everyday states of affairs. Aztecs believed that the wisest course is moderation and thus one should not go to extremes in his or her conduct, as a famous Aztec proverb goes “the centre good is required”. The immoral conduct was known as “tlatlacolli” which literally meant damage or harm. According to them, as a result of immoral conduct, the person underwent a loss of balance and thus suffered from physical and psychological diseases. In Aztec morals and ethics, education had a very important role since it was thought to be the source of wisdom for humans. Human sacrifice was of central importance in Aztec culture and religion, although the exact extent of the practice is debated by the scholars. The practice itself existed in previous Mesoamerican cultures as well and in the Aztec Empire, it became a regular ritual. Aztecs performed human sacrifice during each one of their religious ceremonies which were held at the end of each 20-day month. According to Aztec religious beliefs, the ongoing sacrifice of humans was what appeased the gods and sustained the universe, thus it was considered the highest level of offering to gods. During the ceremony, the person to be sacrificed was taken to the temple at the top of the pyramid and made to lie down on a stone slab. Often he or she would be drugged to reduce the resistance. Priests would then cut out the heart of the victim and throw the rest of the body down the stairs of the pyramid. Aztec culture had a polytheistic religion and like other elements of Aztec culture, there was a deep influence of previous Mesoamerican civilisations in it. The Four most important gods in Aztec religion were Tlaloc who was the god of rain, Huitzilopochtli who was the patron god of the Mexica tribe, Quetzalcoatl who was the god of order and civilisation, and Tezcatlipoca who was the god of destiny and fortune. Other gods included Tonatiuh the god of Sun, Metzil the god of moon, Mictlancihuatl the goddess of the underworld, and others. In Aztec culture, it was believed that a person would go to different realms after death depending on his or her status in this life. For instance, a warrior who died in a battle went to paradise or joined the god Huitzilopochtli in battle. The fate of women who died in childbirth was the same since their status was considered equal to that of warriors. The wise elders of society were called ueuetque and their advice was highly valued in the matters of the family and city council. Their ageing and death were matters of ritual and spiritual importance for the Aztecs. The Aztec culture was the culture of the Mexica people who migrated from the north and established their city-state in the region of Central Mexico. The Aztecs had a rich culture and religion which bore influence of various classical Mesoamerican civilisations. Aztec culture had a class society with varying rights for people depending on their social status. The Aztecs followed a polytheistic religion in which different gods had different powers. Human sacrifice was one of the most important components of the Aztec religion and culture. The Aztecs also had a unique concept of death and the afterlife.